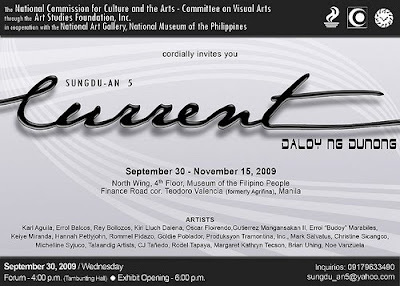 The National Commission for Culture and the Arts – National Committee on Visual Arts through the Arts Studies Foundation, Inc. in cooperation with the National Art Gallery, National Museum of the Philippines will launch SUNGDU-AN 5 with the theme CURRENT: DALOY NG DUNONG on September 30, 2009, Wednesday, 6.00PM at the National Museum (4th flr. Museum of the Filipino People). Participating artists include: Karl Aguila, Errol Balcos, Rey Bollozos, Kiri Lluch Dalena, Oscar Floirendo, Gutierrez Mangansakan II, Errol “Budoy” Marabiles, Keiye Miranda, Hannah Pettyjohn, Rommel Pidazo, Goldie Poblador, Produksyon Tramontina, Inc., Mark Salvatus, Christine Sicangco, Michelline Syjuco, Talaandig Artists, CJ Tañedo, Rodel Tapaya, Margaret Kathryn Tecson, Brian Uhing and Noe Valenzuela. There will also be a Panel Discussion with the Exhibit Curators, Artists and Project Director which starts at 4.00 PM. Exhibition will run until November 15, 2009. For inquiries, contact +63.917.9633490 or e-mail sungdu_an5@yahoo.com.